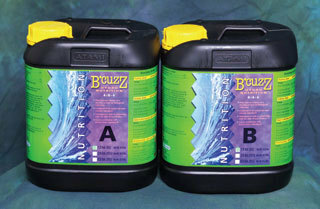 B'Cuzz Hydro Nutrition B has been especially developed for cultivation on hydro systems, where the nutrient solution leaks away from the substrate after irrigation and is not re-used. Hydro B is widely used in cultivation on Rockwool and mapito. It is a professional bio-mineral nutrition, providing a stable and biological equilibrium of the substrate. In addition, B'Cuzz Hydro Nutrition B contains almost all the necessary nutrients for the whole growth stage.